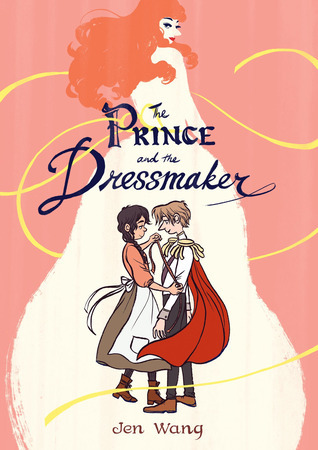 THE PRINCE AND THE DRESSMAKER by Jen Wang! Disclaimer: I received a copy of this book and chose to review it. This in no way impacts my opinion. This was a really cute graphic novel! I loved the artwork and the characters and the story and pretty much everything about this one! I thought it was a great story with an incredible message: be yourself. I liked how strong the characters were and the type of obstacles they faced and overcame. It was nice to see how both Prince Sebastian and Frances stood up for themselves so they could achieve what they wanted. THE PRINCE AND THE DRESSMAKER tackles the fears everyone has when they want to stand out but are afraid of societal repercussions. I absolutely recommend this graphic novel as your go-to for graphic novel reading! But let me tell you a bit more about my FAVOURITE panel from this one. I love this panel because it shows how intertwined Frances and Prince Sebastian are in their life. They both care so much about each other and this panel shows you why. Frances had just learned she can design a line for a fashion show and Prince Sebastian is (trying) to stay up to be supportive to her. It is just amazing to see their friendship and everyone needs a friendship like theirs. Jen Wang is a cartoonist and illustrator currently living in Los Angeles. Her works have appeared in the Adventure Time comics and LA Magazine. She recently illustrated Tom Angleberger's Fake Mustache. Her graphic novels Koko Be Good and In Real Life (with author Cory Doctorow) were published by First Second. jenwang.net.